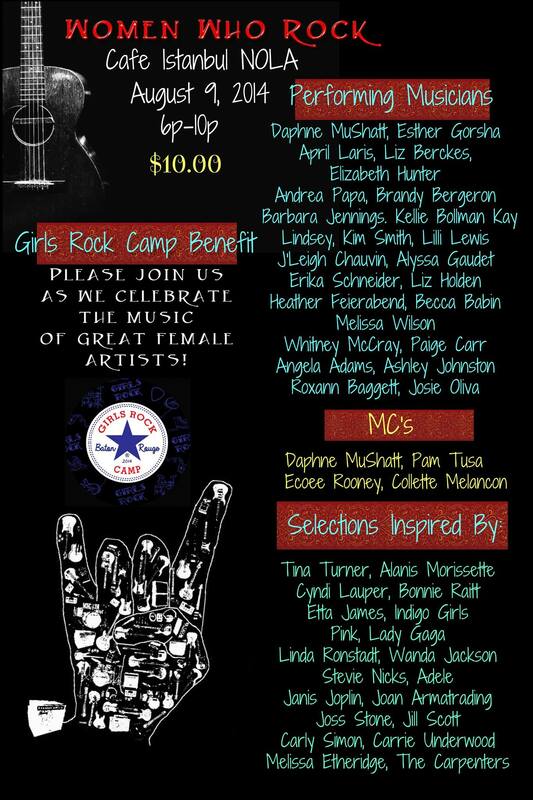 This Saturday, Liz and I will be performing alongside some amazing women musicians from all over Louisiana and beyond in support of Girls Rock Camp Baton Rouge. The show is from 6-10pm at Cafe Istanbul (Healing Arts Center on St. Claude). You don’t want to miss this incredible event and fundraiser for Girls Rock Camp Baton Rouge. Women Who Rock will take place Saturday, August 9th from 6-10p at Cafe Istanbul in NOLA. We will also be auctioning off two guitars, one signed by Patty Griffin and the other signed by Sarah McLachlan!!! Girls Rock Camp Baton Rouge is a nonprofit organization dedicated to creating an environment that supports empowered learning for girls, of all backgrounds and abilities, by using music as a medium to encourage creativity, collaboration, and individuality. We’ll still be at our usual Neutral Ground set as well so Uptown or Marigny, you’ve got two shots to see us!